Standup Paddleboard (SUP) Yoga is the practice of moving through yoga poses while on a floating rigid board. SUP Yoga can be practiced on any body of water! 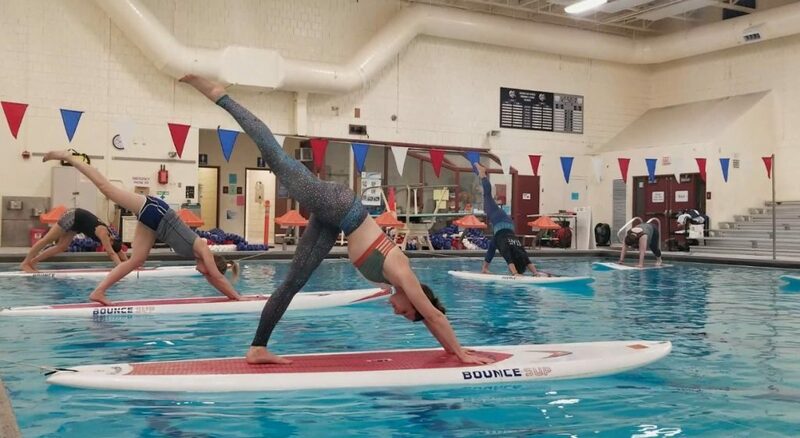 SUP Yoga improves balance, strength, flexibility, and mindfulness! Is it challenging? Yes! If you can stand on two feet, odds are you can stand on a paddleboard! This is a great way to challenge yourself to try something new without having to worry about getting hurt. If you fall off, the water will catch you! Sign Up Now! Last session April 23 – May 7th. Tuesdays from 7:40pm – 8:35pm. Registration now open for 2019 summer session! Looking to book a private SUP Yoga class, inside or outside? Contact me at relax@ashleyflowersyoga.com.